Monsters, Inc. has been my favorite Pixar film ever since I watched it for the first time. I love all of its quirky scenes and Mike's epic one-liners! I was going to try to write a normal review for this film, but it would probably just be full of the word "ASDFGHJKL:" over and over again. 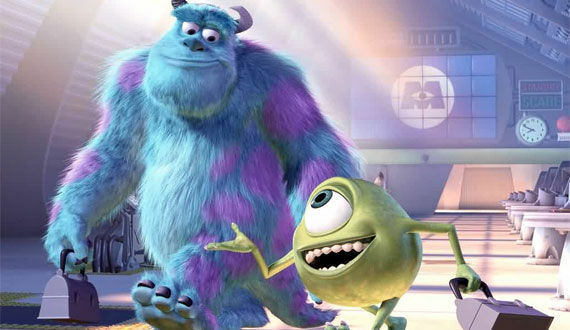 Here are some reasons that Monsters, Inc. should be your favorite movie. Facial expression master, right here. Roz and I are basically the same person. Wow. Such evil. Very lizard. Also: he's the voice of Mrs. Piggy. I need earrings that rattle when I'm suspicious. Just, Mike. Everything he does. What's your favorite Pixar movie, and why is it not Monsters, Inc? Because it should be Monsters, Inc. Even better than the guy who voiced Fungus also voiced Miss Piggy... HE VOICED YODA!!!! This post made me smile. Sometimes I just can't choose a favorite Pixar movie. I mean there's Toy Story ( 1, 2 & 3), Up, Monsters Inc., The Incredibles, etc. SO MANY GOOD ONES. I really do love all of the Pixar movies. I've watched every single one! But, I really love Monsters, Inc. Words cannot express my love for this movie. And Mike Wazowski. And the music. I LOVE the music! The music is beautiful! I want the soundtrack so bad.